On 14 July at about 2100, Richard Mack observed and photographed a white plume that had risen 350-500 m from the SW side of the summit crater of Mt. Hague, near the E margin of Emmons Lake Caldera. A series of pulses slowly diminished in size until sunset at about 2200. Traces of material trailed SSW from the top of the plume. Mack stated that he had not seen such activity during his 57 years on the Alaska Peninsula. However, during fieldwork in 1946, Kennedy and Waldron (1955) observed six large fumaroles and many other small ones in a steep gully on the SW side of Mt. Hague, at altitudes of ~975-1,150 m. They did not give plume heights, but reported clouds of SO2 and steam rising from the major vents, with a locomotive-like noise that was audible ½ km away. The volume of sulfur fumes prevented the geologists from approaching nearer than roughly 100 m from the vents. Sulfur odors were strong many kilometers downwind. Sulfur cones ~1 m high had developed around the vents and extensive deposits of native sulfur were found in the gully. Miller (in Wood and Kienle, 1990) also reported a large fumarolic area on the S side of Mt. Hague. Miller notes two caldera-forming eruptions at Emmons Lake, the second, in late Wisconsin time, depositing non-welded rhyolitic ashflow tuffs >30 km from the caldera rim. Post-caldera activity, dominantly basaltic, generated lava flows from several small cinder cones and vents. Some young Holocene flows advanced through the breach in the S caldera wall to within 1 km of the ocean. References. Kennedy, G.C. and Waldron, H.H., 1955, Geology of Pavlof Volcano and Vicinity, Alaska: USGS Bulletin 1028A, p. 1-20. Miller, T.P., 1990, Emmons and Hague, in Wood, C.A. and Kienle, J., eds., 1990, Volcanoes of North America: United States and Canada: Cambridge University Press, p. 52-53. Information Contacts: J. Reeder, ADGGS. The Global Volcanism Program has no Weekly Reports available for Emmons Lake. The massive Emmons Lake stratovolcano, located north of Volcano Bay and SW of Pavlof volcano, is truncated by one of the largest calderas of the Aleutian arc. The 11 x 18 km caldera contains a narrow elongated lake at its SW end that drains through a breach in the SE caldera rim to the Pacific Ocean. The compound caldera was formed during six voluminous dacitic-to-rhyolitic eruptions between about 294,000 and 26,000 years ago that produced extensive ashflow tuffs. Mount Emmons, Mount Hague, and Double Crater are post-caldera cones of dominantly basaltic composition that were constructed along the SW-NE trend of the elongated caldera, which is up to 1150 m deep. Some young Holocene flows have moved through a gap in the southern caldera rim to within 3 km of the ocean. A large fumarolic area is located on the south side of Mount Hague, and the only reported historical activity was the emission of steam plumes from Hague in 1990 and 1991. Kennedy G C, Waldron H H, 1955. Geology of Pavlof volcano and vicinity Alaska. U S Geol Surv Bull, 1028-A: 1-18. Motyka R J, Liss S A, Nye C J, Moorman M A, 1993. Geothermal resources of the Aleutian arc. Alaska Div Geol Geophys Surv, Prof Rpt, no 114, 17 p and 4 map sheets. Smith R L, Shaw H R, Luedke R G, Russell S L, 1978. Comprehensive tables giving physical data and thermal energy estimates for young igneous systems of the United States. U S Geol Surv Open-File Rpt, 78-925: 1-25. Smithsonian Institution-GVN, 1990-. [Monthly event reports]. Bull Global Volc Network, v 15-33. Waythomas C F, Miller T P, Mangan M T, 2006. Preliminary volcano hazard assessment for the Emmons Lake volcanic center, Alaska. U S Geol Surv, Sci Invest Rpt, 2006-5248: 1-33. The Global Volcanism Program is not aware of any Holocene eruptions from Emmons Lake. If this volcano has had large eruptions (VEI >= 4) prior to 10,000 years ago, information might be found on the Emmons Lake page in the LaMEVE (Large Magnitude Explosive Volcanic Eruptions) database, a part of the Volcano Global Risk Identification and Analysis Project (VOGRIPA). There is data available for 1 deformation periods. Expand each entry for additional details. Remarks: Emmons Lake Caldera exhibits persistent subsidence. There is a gap in InSAR data coverage between 1997 and 2003. From: Lu and Dzurisin 2014. Reference List: Lu and Dzurisin 2014. Lubis, A. M., 2014. 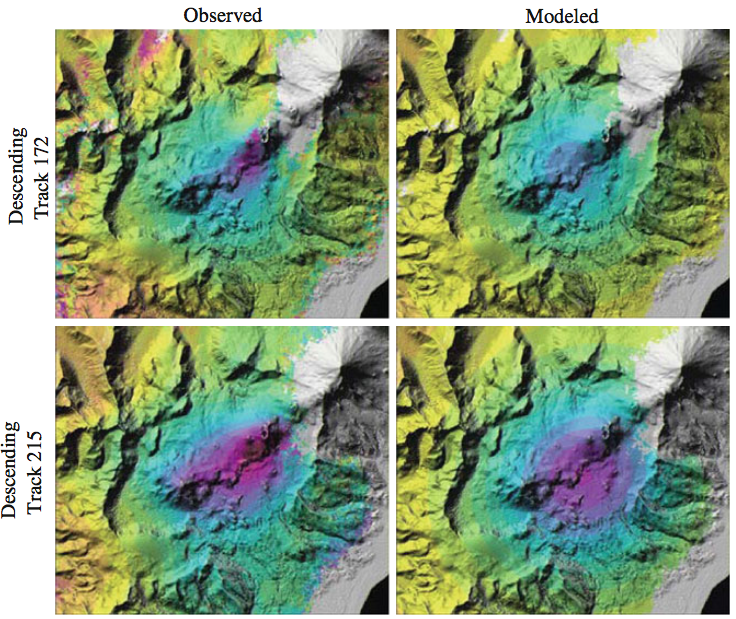 Uplift of Kelud Volcano Prior to the November 2007 Eruption as Observed by L-Band Insar. Journal of Engineering and Technological Sciences, 46(3), 245-257. There is no Emissions History data available for Emmons Lake. 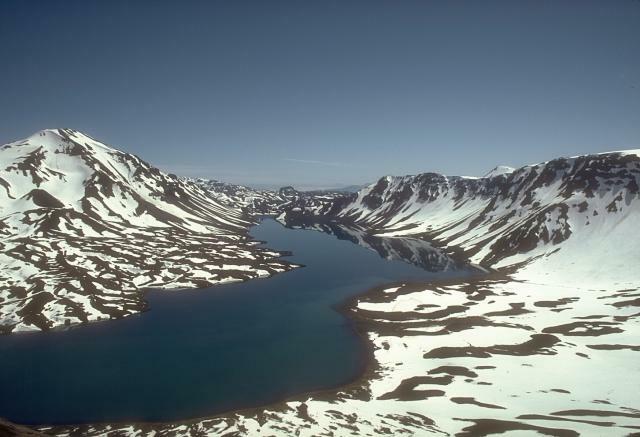 Emmons Lake is a massive 11 x 18 km caldera that is one of the largest calderas in the Aleutian arc. The caldera was formed during two very large Quaternary eruptions that produced welded tuffs that reached both the Bering Sea and Pacific Ocean. This 1988 view from the SW shows the crescentic Emmons Lake, the south caldera wall (right) and Mount Emmons, a post-caldera volcano (left). The three post-caldera cones of Mount Emmons, Double Crater, and Mount Hague are oriented along the same NE trend as the elongated caldera. Photo by Tom Miller, 1988 (U.S. Geological Survey, Alaska Volcano Observatory). Mount Emmons, a 1436-m stratovolcano (right center), was constructed at the SW side of the 11 x 18 km Emmons Lake caldera. Youthful lava flows from Mount Emmons form the irregular shoreline of Emmons Lake in the foreground. 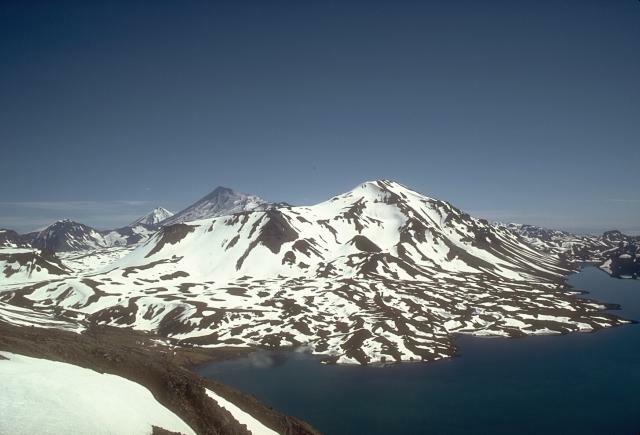 The high peaks in the background (left center) are Pavlof volcano, which was constructed just beyond the NE rim of Emmons Lake caldera, and Pavlof Sister volcano. No historical eruptions are known from Emmons Lake, although steam emission was observed in 1990 and 1991 from Mount Hague, hidden behind Mount Emmons in this view. Photo by Tom Miller (Alaska Volcano Observatory, U.S. Geological Survey). 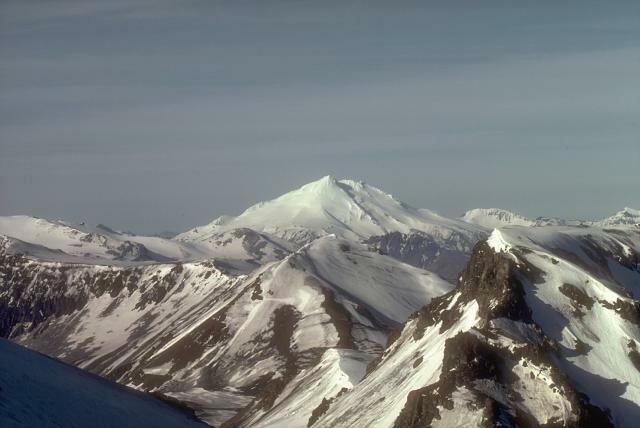 Snow-capped Mount Dutton volcano, seen here from the NE with the wall of Emmons Lake caldera in the foreground, is a small stratovolcano near the tip of the Alaska Peninsula. Successive dacitic lava domes overlying andesitic lava flows form the summit. Collapse of the summit during the Holocene produced debris avalanches that traveled to the west and also reached Belkofski Bay to the south. No historical eruptions are known, although earthquake swarms were recorded in 1984-85 and 1988. Photo by Betsy Yount, 1986 (Alaska Volcano Observatory, U.S. Geological Survey). The following 8 samples associated with this volcano can be found in the Smithsonian's NMNH Department of Mineral Sciences collections, and may be availble for research (contact the Rock and Ore Collections Manager). Catalog number links will open a window with more information. IRIS seismic stations/networks Incorporated Research Institutions for Seismology (IRIS) Data Services map showing the location of seismic stations from all available networks (permanent or temporary) within a radius of 0.18° (about 20 km at mid-latitudes) from the given location of Emmons Lake. Users can customize a variety of filters and options in the left panel. Note that if there are no stations are known the map will default to show the entire world with a "No data matched request" error notice. Large Eruptions of Emmons Lake Information about large Quaternary eruptions (VEI >= 4) is cataloged in the Large Magnitude Explosive Volcanic Eruptions (LaMEVE) database of the Volcano Global Risk Identification and Analysis Project (VOGRIPA).